Knowing the best mattress for kids is important. What’s the most important thing about bedtime for your children? You will likely say that it is that they get to sleep quickly and stay asleep until morning. You Wish!! What else? How about Safety? OK, you got that. How do you know which children’s mattresses are safe for your kids? How about keeping them free of Dust Mites and Germs? It’s important you protect your kids free of these common issues with mattresses. How about supporting your child’s growth? Yes, you probably think that all mattresses will adapt to the growth and changing weight of your child. Not true! Many parents think only of how comfortable the mattress is for their kids. That’s understandable! A comfortable mattress helps them sleep longer without waking up – and waking you up! Here are some suggestions that will help you take care of all the above issues simply by purchasing the best mattress for kids that is available to you. Mattresses have developed significantly over the past few years, and the best mattress for kids in 2019 is way more advanced than those available to parents even 5 years ago. The one thing that you absolutely need for your children is to make sure they are free from germs and dust mites throughout their young and vulnerable years. This is something that is sometimes is easy to overlook no matter how hard you try. Have you ever considered the mattress they are sleeping on? Did you know that your children can easily be a victim of bed bugs, dust mites and other allergens that can make their lives a misery? Here are the best mattresses for kids that I have found during my investigations. I first list my choices and then explain why I chose each individual child mattress. The above three best mattresses for kids have been chosen partially for their firmness, and their ability to properly support a growing child, and partially for their purity of raw materials and lack of emissions and potentially harmful chemicals. There may be others, but I feel that above three children mattresses will meet the needs of your son or daughter. 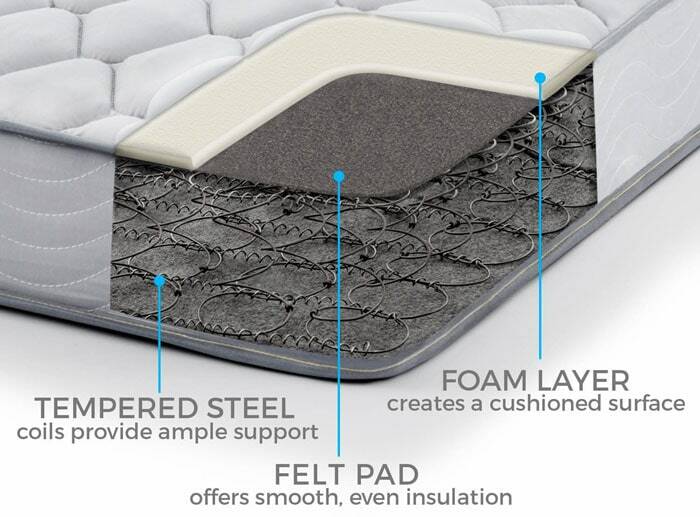 The Signature Sleep Contour 8-inch mattress is a coil spring mattress sandwiched between two 1.6 inch layers of high density foam. The coil section consists of 480 individually encased 15 gauge 7-inch pocketed steel coils. That means that the individual coils can contour to your child’s body and provide a more comfortable night’s sleep by relieving the pressure of the mattress on the hips, shoulders, spine and other pressure points. The support provided helps to ensure that your child grows with a correctly shaped spine and good posture. The mattress comes with a soft cover, and it can be used on a variety of children’s bed bases: box spring beds, platform and trundle beds, bunk beds and all other types of base that can hold a twin mattress. It is two-sided, so can be flipped to even out wear. It is also a low VOC (volatile organic compound) mattress that is CertiPUR-US ® certified. This signifies that this children’s mattress contains no oxygen depleters, heavy metals or anything else that is known to be harmful to kids. It is also resistant to bacteria and bugs. Can used on most supports including box spring, slats or even a board. Resistant to bacteria and bug infestations. Individually pocketed coils than even out the pressure for maximum body support. Not really a ‘Con’ – Some of the complaints from the 4% negative reviews refer to adults leaving indents in the mattress after a few weeks or months of use. This is a twin version of a product which makes a marvelous kids’ mattress, and certainly has a significantly longer life with a child than it might for an adult. It supports your child’s spine and maintains its natural curvature when your son or daughter is sleeping. It ensures that your children will avoid back pains and pressure sores during the 30%-40% of their lives they will spend lying on the mattress you have chosen for them. Being CertiPUR-US ® certified, their mattress will not emit harmful fumes or chemicals. Another reason for this being my choice as best mattress for kids 2019 is that it can be used on practically any base. It can even be used on the floor if your child wants what for them may be an exciting change. Being a twin mattress, it is also good for sleepovers. This is without doubt one of the best children mattresses I have ever reviewed. The Zinus Sleep Master Ultima Comfort is available in 8” Twin-size. It is an excellent mattress for children, offering plenty space and amazing comfort. It is a memory foam mattress, however, and many recommend that such foams should not be used for young children. While this is true, the memory foam in the Zina Sleep Maser Ultima is only 2-inches thick, and presents no risk to kids old enough to leave the cot. 4 inches of high density latex foam that provides the main support layer. A 2 inch layer of pressure-relieving comfort foam that provides your kids with a comfortable sleep. Not enough to cause any issues, but enough to provide some of the benefits of this unique type of foam and give your child a safe but amazingly comfortable bed to lie on. This memory foam is BioFoam, using natural plant oil in place of some of the petroleum oil used to manufacture the foam. This keeps the mattress fresh and healthier. This all comes together to provide one of the best mattresses for kids ever manufactured. 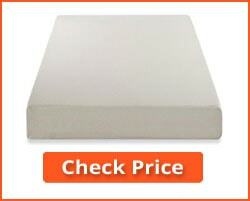 Thin layer of BioFoam memory foam to provide the comfort of memory foam for your child. High density latex foam core to provide a strong base that prevents your children from sinking into the mattress and sleeping with the wrong posture that can lead to issues later. Foam is CertiPUR-US Certified for performance and freedom from hazardous content. Resistant to bacteria and bedbug infestations when you use a mattress cover. Some issues regarding wear and the mattress losing shape fairly quickly. However – the vast majority of these related to adults using the mattress. Kids will have less of an effect. Nor really a con but should be mentioned: some people not like using memory foam with their children. However, the 2”-thick layer is highly unlikely to put your child at risk, particularly one old enough to sleep in a bed rather than a crib or cot. Editor’s Note: This mattress provides an ideal opportunity for parents to introduce their children to the amazing properties of memory foam. 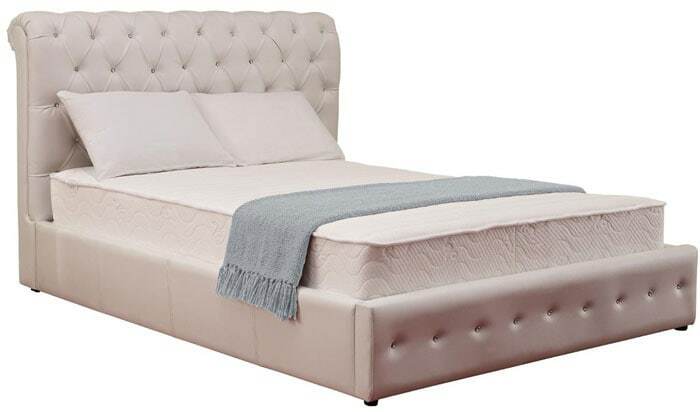 The 2-inch thickness, CertiPUR certification, and BioFoam nature of the memory foam, means that this is the best type of memory foam mattress to use for this purpose. That is why I have included in amongst the best mattress for kids this year. I though very hard before finally putting this second in my best Mattress for Kids 2016 list rather than at the top. It doesn’t bounce much at all, having no springs, although you may think that a benefit because bouncing significantly reduces the life of a mattress. This is a thinner kid’s mattress at only 6-inches. It is a traditional innerspring mattress with a good bounce to it – your kids will love it! The spring system is connected heavy gauge steel coils that provide good support for its 6-inches. The mattress comes with layer of latex foam above the springs and then a quilted fabric cover. It is not double-sided, so you cannot flip it, but you can turn it to extend its life. 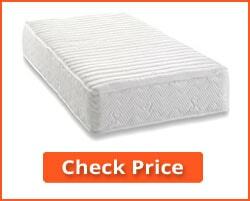 It is a durable mattress for children and suitable for those on a tight budget. It is bouncy and your kids will love it. Thin at 6-inches with a thin quilted fabric cover. Available only in contiguous USA. Editor’s Note: This is a traditional children’s mattress that your kids will love because it is bouncy as you likely remember your own ‘grown-up’ mattress to be. However, it is basic and cannot be flipped because it is one-sided. You could flip it, but you would then lose the quilted comfort layer. Safety: make sure your child is old enough to sink into a foam mattress and get out again. Very young children can be at serious risk in a thick memory foam mattress because they may not have the strength to lift their faces out of the relatively deep indentation that memory foam mattresses can form. Or recommended memory foam mattress for kids has only a 2-inch thick memory foam layer which is fine for young children past the crib stage. Chemical-Free: The best mattresses for kids have at minimum CertiPUR-US Certification, or any other national certification indicating that the mattress is with safe limits of additives, heavy metals and chemical emissions. It should also be fire-resistant without the use of hazardous fire- resistant chemicals. The 2-inch layer of memory foam in this mattress emits fewer chemicals than thicker layers of memory foam would do. Posture: It is traditionally believed that a firm mattress is better for the back. It is now believed that a soft padding can help the spine retain its curvature – the spine is not straight but naturally curved. Babies need a hard surface to sleep on due to the danger of smothering in a soft bed and SIDS. However, young children are fine in a regular bed, and can sleep in a thin memory foam or plush comfort layer over a firmer core. Comfort: purchase a mattress that you believe is comfortable for your child. If it is not, then he or she is liable to remain awake or waken up early and give you an early rise yourself. The quality of sleep your child enjoys is related to the comfort of the mattress. Endurance: You want your child’s mattress to last as long as possible. I also know what kids are like, and if it is possible for them to destroy a mattress in no time at all then it will be destroyed in record time. It’s like a challenge to many children – how long will this last? Let’s see!! All of these are important, and while I have placed endurance last it is still important. What parent wants to purchase a new mattress every month or two? There may be other safety factors and standards/certifications you should take into consideration according to your country of residence. However, the three above are the major safety aspects of children mattresses that you should consider. a) No Side Supports: They are no longer in their crib with sides to hang onto. They may bounce right out of the bed and land on something that could harm them. So bouncy mattresses are great for the kids, but bouncing about without the sides of their cot to keep them there could be dangerous. c) Mattress Covers: It pays to purchase a waterproof cover for your children’s mattress. This not only protects the mattress from urine when your child has an ‘accident’ but it also protects it from contamination from spilled drinks, food and confections that children like to eat in bed! Mattress covers also keep bed bugs and bacteria away from the structure of the mattress itself. Mattress covers are easy to clean, so buy two for maximum protection. The mattress I have selected as being the best for kids in 2019 is the Signature Sleep Contour 8-Inch twin size. This has been designed as an adult bed, and the twin size is good for young children. Not many adult mattresses are suitable for kids, but this one has been chosen for its pocket spring construction. This construction provides a good strong spring to the mattress, while the pockets isolate each spring from its neighbors. This provides a good solid firm base for a child, while it also conforms to the natural shape of the spine. Too hard a bed without this individual springiness will not be comfortable to a child. A memory foam offers similar type of support for the natural body contours, but I feel that springs contain fewer chemicals that foams. My list of three provides you options: a pocketed spring construction, a thin 2-inch layer of memory foam to give your child that experience and a regular spring mattress that let’s then bounce about and stay happy. If you also purchase a mattress cover for them, it should be happy days with each of these because all offer a unique yet safe sleeping experience for your kids.